Welcome, my name is Jack I’m the owner of Triggervision. I started this company in 2007 to offer comprehensive design & multi-media solutions for businesses & organizations who want professional results combined with personal service & affordable prices. I am trained in the latest industry standard software and I am always keeping up to date on the latest print, production, & design techniques. Visually Striking & Clean Design. Latest Print, Web, & Production Techniques. One on One Customer Service with the Owner. Affordable Pricing for Prestigious Results . I graduated from Washington State University in 2007, with a bachelors degree in Fine Art. There I studied art history, multi-media, photography & traditional art techniques. After that I began taking classes at Portland Community College where I worked towards a certificate in web development and design. I also took classes in Business, Marketing, & Advertising. I recently completed the year long program in Studio Recording Technologies, where I learned all aspects of recording & sound engineering principles. 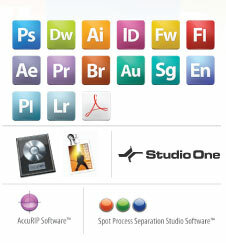 We Use the latest installment from the Adobe Creative Suite. The Majority of our work is done here including Illustrator for vector graphics, Photoshop & Fireworks for Image work, Premiere Pro & After Effects for video work. If you have any questions about file types please go to our file Prep page. For screen printing we use Separation Studio & Accurip the industries cutting edge software for film output & simulated process separations. When it comes to Audio Logic Pro Studio, & Presonus Studio One are our programs of choice, including many 3rd party plug-ins and applications. Including the latest technologies from brands like Apple, Epson, Oki, Summa, Presonus, Shure, Nikon & many more. At Triggervision we understand the need for having the right tool for the job. A large part of the revenue brought in is invested in the latest products & gear that provide an integral piece in the chain of production that leads to professional results. 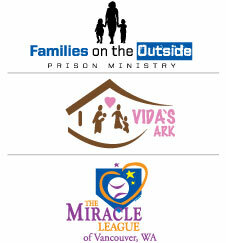 Some of the groups I work with include, Families on the Outside & Angle Tree Ministry, Vida's Ark, The Miracle League of Vancouver. If you have a non-profit or charity organization contact us about possible sponsorship and discounted products & services. Help support growth in local small business and the local economy.